The production of hair is not continuous but cyclic. The growth phase (Anagen) is succeeded through a transitional phase of regression (Catagen), by the rest phase (Telogen), and the cycle is preserved. During the relatively long Anagen phase (lasts for 1,000 days, i.e. 2- 5 years), the matrix cells divide, become keratinized and hair is produced. The Catagen phase lasts for about 2-3 weeks and is practically unimportant. 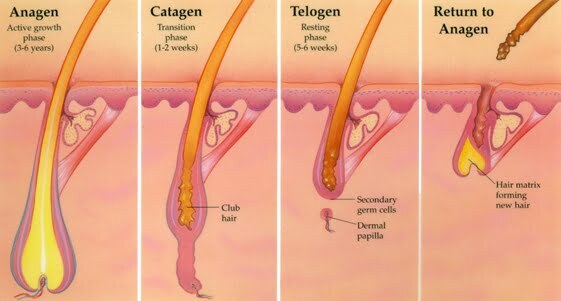 During the Telogen phase, that lasts for several months, the cell division stops, hair growth ceases, and the attachment of the hair to the base of the follicle becomes progressively weaker. Finally, as a result of ordinary traction, whether that be from combing, from washing, its own weight, or a push by a new, growing hair, the old hair is eventually shed and discarded. In most mammals, the cycles of follicular activity in each region of the body are synchronized, and waves of growth radiate from one or more centers. In humans, follicular activity has a mosaic pattern (dysynchronous), with neighboring follicles being at different stages of the hair growth cycle. At any given moment in time, roughly 90% of the terminal hair is in the growing phase and the other 10% is resting. On average, 100 hairs are physiologically shed on a daily basis throughout the human scalp, at random. Certain common events can alter this shedding. For example, during pregnancy more follicles are maintained in the growing phase and there is less shedding than usual. After delivery, about 30% of the follicles simultaneously go into the resting phase, causing a temporary, self-correcting, profuse shedding generally about 3 months postpartum. A prolonged febrile episode induces an increase in telogen, with a period of shedding noticeable about 3-12 weeks later. Finally, the hair cycle is also subject to chronological influences. During the autumn months, daily hair shedding may double, while there is diminished shedding in the spring. Both the duration of hair growth and the daily growth rate are greater in summer than winter. The study of the hair cycle attitude is attainable today with the microscope.